Save the date for Light Up North Area 2017! 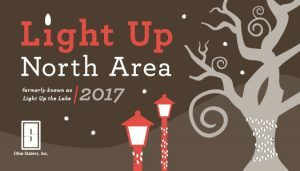 | Ohio Staters, Inc.
Save the date for Light Up North Area 2017! Light Up North Area 2017 will take place on December 6, 2017. Arrive at 6 p.m. to enjoy refreshments and the ceremony will begin at 6:30 p.m. Kick off the holiday season with an outdoor lighting ceremony outside of the North Recreation Center including friends, fun, and many student performances. The ceremony will conclude with a candlelit rendition of Carmen Ohio lining the Oak Walk. Hope to see you there! ← Now Giving Tours of Orton Hall!